There used to be a time when most products were based on a general purpose MCU or processor that you would interface to over chips like audio codecs, memory chips, flash storage, etc…, but in order to cut costs, application specific SoCs have become quite common over the year, so we’ve had mobile application processors for several years already, but more recently we got “wearables” SoCs and “Smart Home” SoCs, and Mediatek has launched MT2533D “headphone” SiP (System-in-Package) combining a Cortex-M4 MCU, 4MB PSRAM, an audio codec, and a dual mode Bluetooth subsystem. There are interfaces for small displays and low resolution cameras, as well as a fair amount of I/Os, so it could certainly be use for audio applications outside of simple headphones, not matter how “smart” they may be. 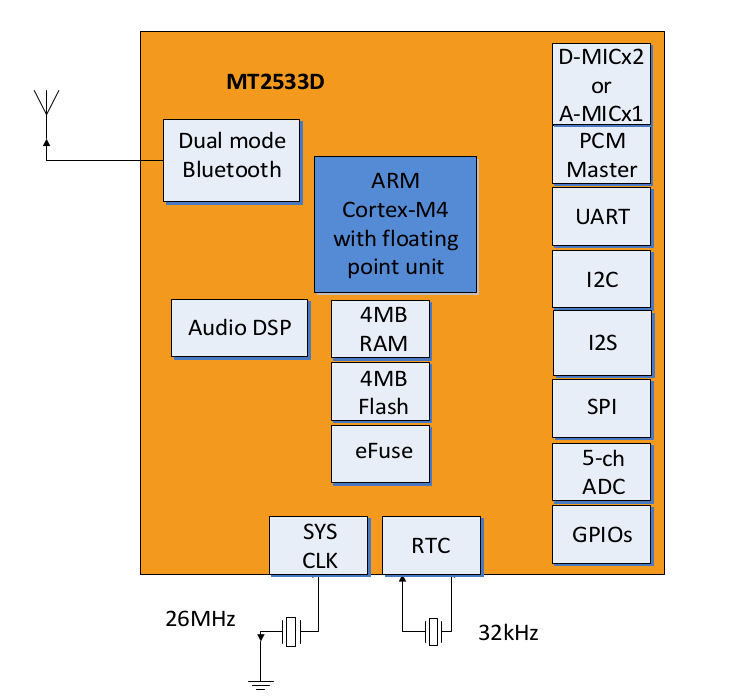 One interesting part is that I did not get the news from MediaTek, but instead MediaTek Labs, Mediatek’s Internet of Things (IoT) developer program, and MT2533 is supported by the MediaTek LinkIt Development Platform for RTOS based on FreeRTOS. That means the SiP will be available to makers, and not only large companies, and development and debugging can be done in ARM Keil μVision, IAR Embedded Workbench and GCC like other LinkIt platforms. A development board or, like Mediatek calls it, an HDK (Hardware Development Kit), based on MT2533D could also be launched in the near future. However Mediatek Labs only mentioned that MT2533D will be available to device makers in Q1 2017, and the developer documentation and tools will be released in Q3 2017, so we will have to wait for a while before being able to play with the platform. More details can be found on MT2533D product page. Interesting that they should support AAC over bluetooth, I wonder whether they could licence the AptX or AptX-HD codec from Qualcomm. How. Can i get a freesample ? ?